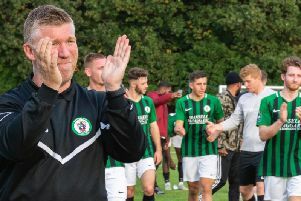 Darren Budd has said leaving Burgess Hill Town is one of the hardest decisions he has had to make in his footballing career. The club announced their skipper was leaving at the weekend on their website. Budd was Ian Chapman’s first signing for the Hillians and he has spent four seasons at the club. He told Middy Sport: “Deciding to move on from Burgess Hill was probably one of my hardest decisions I’ve ever had to make in my footballing career so far. “I’ve had four great seasons, the pick of the bunch was the season before last. It’s one I’ll never forget. Winning the league in such a dominant way and the with the group lads I did it with was incredible. So where will Budd pop up next? He said: “No plans to where I’ll be playing football next season as of yet, I’m just enjoying my time off and not aching on a Sunday morning! “Again I’ve had four great seasons in a Burgess hill shirt and will not forget the great support of the fans and all the people in the background who do a fantastic job for the club. Ian Chapman told the club’s website that he and Budd has ‘shared some fantastic times together’.